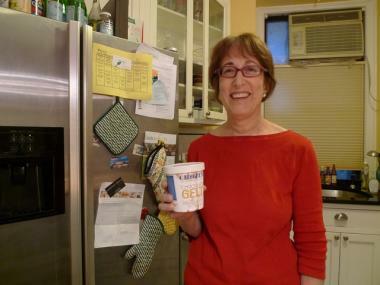 Laura Weiss, an Upper West Side food blogger and author of "Ice Cream: A Global History," poses in her kitchen with Chozen, a Jewish-themed ice cream. UPPER WEST SIDE — Everyone knows George Washington was the first president, but the father of our country was also an ice cream lover who complained in his diaries about the challenges of building an ice house to store his favorite dessert. That's one of many fun frozen treat facts that Upper West Side writer Laura Weiss uncovered as she researched her new book, "Ice Cream: A Global History." Weiss, a career journalist who teaches at New York University, writes the blog Food and Things. It covers Upper West Side restaurant and food news and culinary events citywide that Weiss thinks would appeal to Upper West Siders. Some of her favorite posts include a recent entry about Tina Fey's photo hanging in the Manhattan Diner, and a post about "the best hot dog in the New York area," which Weiss says can be found on the North Fork of Long Island, an area she calls the Upper West Side of the East End. Weiss has also written about how gourmet food trucks seem to ignore the Upper West Side, and revealed her husband's grandmother's noodle kugel recipe, long a closely guarded secret. To research "Ice Cream: A Global History," Weiss examined old newspapers and recipe books and spent hours at NYU's Fales Library, a collection of food and cookery materials. And of course she sampled about 15 or 20 varieties of ice cream, with help from her husband, who was glad to pitch in on research efforts, Weiss said. Along the way, Weiss discovered that ice cream's history mirrors that of products such as coal or steel. It was once a hard-to-procure commodity that only the rich could afford, until entrepreneurs figured out how to mechanize its production, Weiss said. "They turned ice cream from a product for the elite to a mass market product," Weiss said. Though Philadelphia is often credited as the birthplace of American ice cream, Weiss' book reveals that some of ice cream pioneers were in New York. Good Humor's original headquarters was in Brooklyn, and two brothers from Coney Island invented frozen custard. A 19th-century chef at the legendary Delmonico's restaurant is believed to have invented the ice cream dish Baked Alaska. Weiss also discovered that just about every culture has its own version of ice cream, including a Turkish type that's so thick it must be eaten with a fork and knife, she said. "About the only thing that the Arabs and Israelis can agree on is they both love ice cream," Weiss said. "It's a unversal food. It makes everyone smile. Who doesn't want to write about that?" Weiss will be speaking at an "all ice cream dinner" on Monday June 6 from 6 p.m. to 8:30 p.m. at the Roger Smith Hotel on Lexington Avenue and 47th Street. Dishes on the menu include beet carpaccio with goat cheese ice cream and venison loin with lingonberry ice cream. Tickets are $45 and include a copy of Weiss' book. Click here for more information from neighborhood blog West Side Rag.